Remember the famous Baby Got Back wedding dance? It was one of the first wedding dance videos to go viral on the Internet. 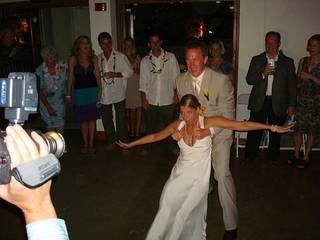 Before the JK Wedding Entrance Dance, this couple John and Michelle started a trend of surprise first wedding dances. We have a found a rare video of the couple being interviewed and performing their wedding dance on the Today Show. It was the Bride, Michelle's idea to do the dance to Baby Got Back. She said it was one of her favorite old school dance songs, and wanted to put a twist on their first dance to get the guests in the festivities and spirit of the wedding. The Bride and Groom choreographed the dance all on their own. No one else at the wedding, except the DJ and photographer, knew about the surprise dance, they where all in shock and in hysterics.